Barcelona can buy and sell players this summer after Fifa suspended its transfer ban on the club. The Spanish giants were given the 14-month ban after being found to have breached rules on signing international players under the age of 18. However, the suspension is now on hold pending an appeal. February 2014: Barca pay £11.2m to the Spanish authorities after being charged with tax fraud over Neymar, but deny wrongdoing. April 2014: The club are banned from signing players for 14 months before Fifa puts the punishment on hold, pending an appeal. Barca have been linked with Borussia Monchengladbach keeper Marc-Andre ter Stegen and also have a deal in place to sign Croatia midfielder Alen Halilovic. Captain Carles Puyol and long-serving goalkeeper Victor Valdes have both announced they will leave the Nou Camp at the end of the season. The Spanish champions were originally sanctioned by Fifa's disciplinary committee on 2 April for breaking the rules in the case of 10 minors and punished with the ban and a fine of 450,000 Swiss francs. After Barcelona followed through on their promise to fight the ban, Fifa decided that due to the complexity of the case and the possibility of a further appeal to the Court of Arbitration for Sport (Cas), it was unlikely to be concluded before the opening of the transfer window on 1 July and therefore suspended the punishment. The Fifa investigation centred on several players aged under 18 who were registered and played for Barcelona between 2009 and 2013. 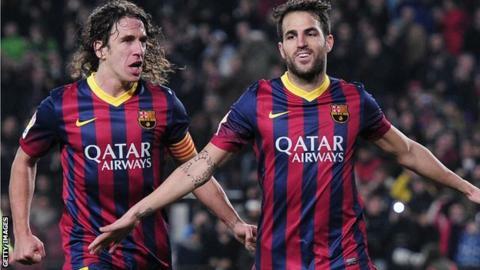 Fifa told BBC Sport the identity of these players is confidential.